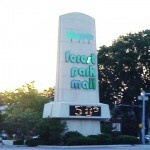 Forest Park, Illinois is an inner-ring suburb of Chicago, located about 10 miles directly west of downtown. Most of the built environment in Forest Park is a result of the post-World War II building boom, and most of the housing stock is between 40-60 years old. Forest Park is hemmed in by other inner-ring suburbs of similar age. Oak Park, Maywood, River Forest, and Riverside are all neighbors of Forest Park, and other large suburbs like Berwyn and Cicero are nearby. Because of this, Forest Park is done expanding – at least outwardly. The demographics in these post-war inner-ring western suburbs vary wildly. Oak Park is known for its tony neighborhoods of stately mansions and its upmarket downtown; Maywood is almost 90 percent African-American; Berwyn and Cicero have transitioned from Italian to Mexican; Riverside is a quiet, suburban, mostly white enclave of upper middle class homes situated along curvy, tree lined streets. Forest Park is more of a melting pot in terms of demographics, and more diverse than many of the other suburbs; in addition, it has a centralized location along the Eisenhower Expressway (I-290), giving it direct access to downtown Chicago as well as points west. 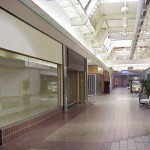 The retail scene in Forest Park itself, however, is kind of lacking. Downtown Oak Park has a myriad of options, including mall store chains like The Gap, but the nearest mall and a large concentration of box store options is located just a few blocks south of the city along Cermak Road and Harlem Avenue in the village of North Riverside. 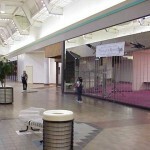 This corridor also contains a large, regional two-level mall, North Riverside Park Mall, which opened in 1976 and features Carson Pirie Scott, JCPenney, and Sears. 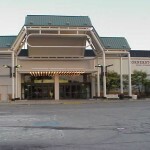 It wasn’t until the early 1980s that a situation emerged giving Forest Park a chance to build a significant retail venture, the Forest Park Mall. 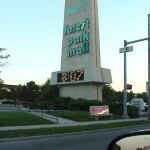 Forest Park Mall was a 400,000 square-foot enclosed mall located along Roosevelt Road just west of Harlem Avenue, and about a quarter of a mile south of I-290. Helmed by the same developer who created Ford City Mall on Chicago’s southwest side, Forest Park Mall – just like Ford City – was also a redevelopment project that converted an old factory into a shopping center – albeit on a smaller scale. The site that would become the mall originally operated as a Naval torpedo plant during World War II. After the war, the site was used as a Naval training academy, and subsequently utilized by the U.S. Postal Service for a time after that. Then, in the late 1970s, the then-abandoned building was purchased by the city of Forest Park. Not knowing what to do with the abandoned eyesore, which had been off the city’s tax rolls due to the fact that it was owned by the federal government for decades, several options emerged for the site, including retail and manufacturing operations. It was quickly determined the best use for the site would be retail, as there was little interest from companies wishing to relocate here, and the revenue generated from retail would put more money into the city’s coffers; Forest Park’s tax base was already extremely restricted because there weren’t many businesses in the city, and much of the city’s land is cemeteries. Win, win. The city, who owned the site, then teamed up with the same developer who converted the Ford factory on Chicago’s southwest side into a successful regional mall in 1965. Because of the space constraints of the building and the 1976 opening of North Riverside Park Mall, a large, regional mall just one mile to the south, it was determined that the retail development in Forest Park would be smaller, at least to begin with. 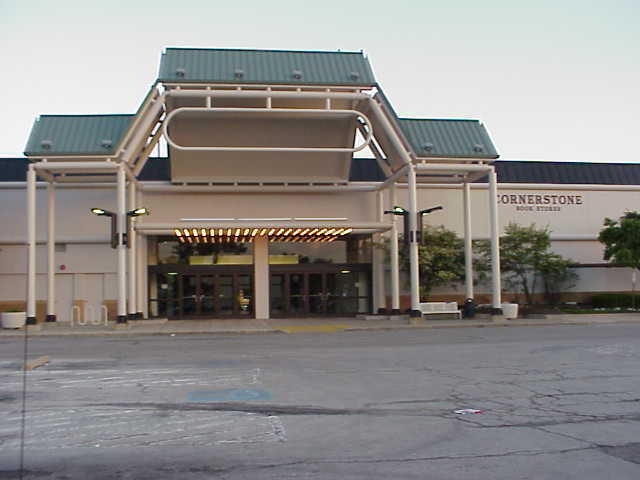 Forest Park Mall opened in 1983, anchored by a Venture discount store on the west end and a Courtesy Home Center home improvement store on the east end, complemented by an enclosed hallway of stores connecting the anchors, containing room for 70 stores. Some early stores in the mall were Deb Shops, Perry’s Drugs, Tom Olesker’s Menswear, and Gift Horse. In addition, a giant Child World children’s store/castle was built on the northwest corner of the mall’s lot. 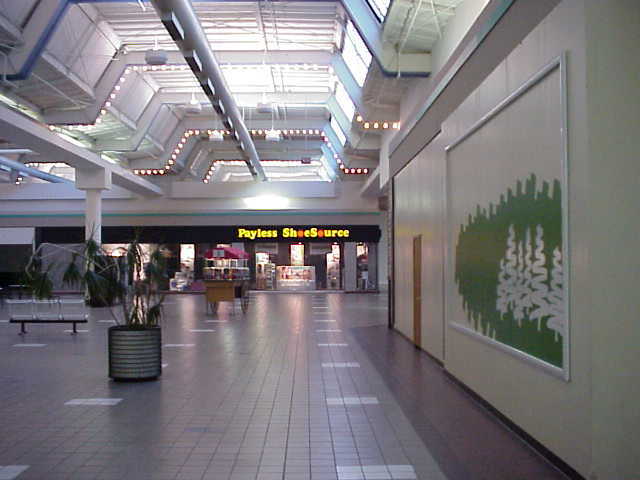 The decor of the mall featured period-typical beige walls with wood paneling and multiple skylights throughout the interior walkway, providing ample natural light. A small lower level also existed, but was mostly used for offices and restrooms rather than retail use. 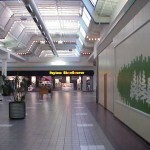 Forest Park Mall received its only expansion when a small food court was built near the Venture end of the mall, with its own dedicated entrance to the south of the mall. 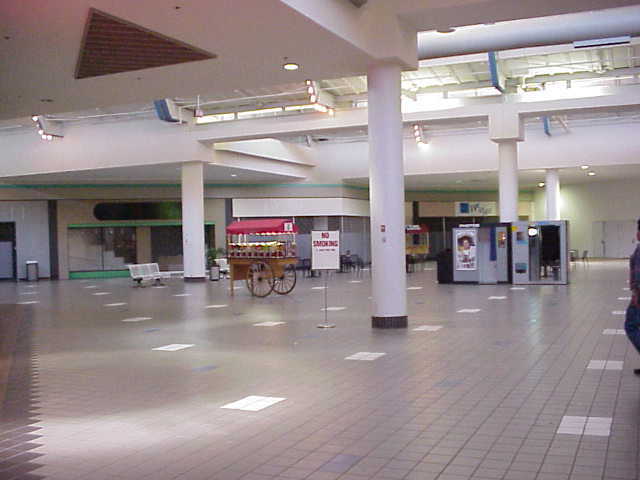 The food court, much like the rest of the mall, was never fully tenanted. However, the mall never filled to capacity, so management brought in temporary stores and filled in smaller store spaces with larger stores. Holidays brought Spencer’s Gifts and temporary store FIM, which sold Christmas merchandise during the winter, and TJMaxx was also brought on board. 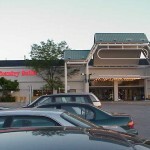 Old Country Buffet also opened near the mall entrance closest to Venture in a former shoe store. 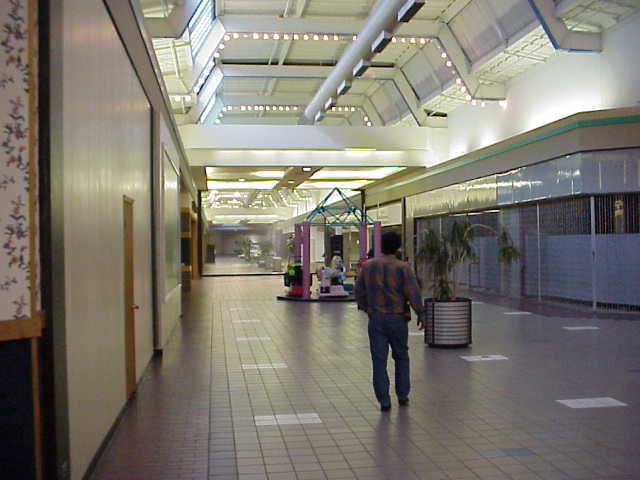 Unfortunately, throughout the 1990s Forest Park Mall encountered many setbacks. First, Venture decided to remodel their store, and in doing so, shut their entrance to the mall. Whoops. Courtesy Home Center closed their eastern anchor store a couple years later, and left with only TJMaxx as an anchor the stores began to leave in droves. TJMaxx eventually closed also, leaving the mall somewhat anchorless, and the Forest Park library took up temporary residence in the mall’s lower level while a new facility was being built. Meanwhile, the large Child World castle closed in the early part of the decade and was demolished for a Portillo’s Hotdogs location. 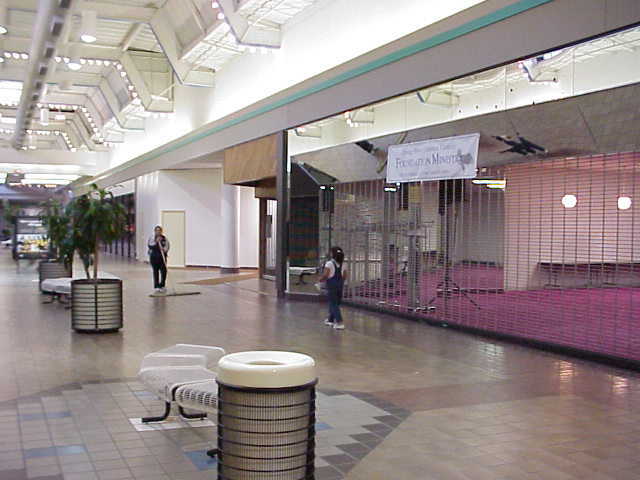 In 1998, anchor Venture went under as the whole chain went out of business, leaving another ominous hole in Forest Park Mall’s roster. It was, however, miraculously filled rather swiftly with a K-Mart store which still operates as of 2009. 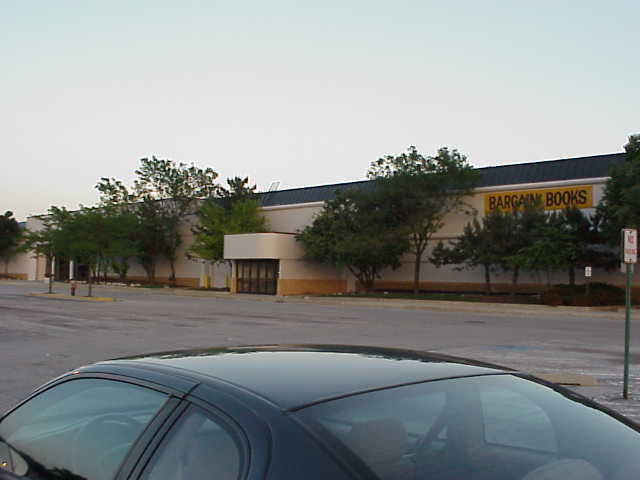 About the same time Venture discount store left Forest Park Mall, a new and unique venture moved into the former Courtesy Home Center on the other end of the mall – a church. 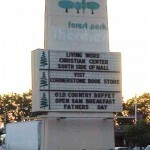 The Living Word Christian Center, Pastored by Bill Winston, opened up shop in the former home improvement anchor in 1998, and has since expanded throughout the entire mall. Living Word now owns the entire mall and its outlots, including Portillos, and has expanded its church services into the mall. According to Pastor Winston, the vision for the mall is a “one stop shop for the spirit, soul, and body.” There’s also a business school in the mall, and a handful of other stores and services, including a clothier aimed at young black men. At one point, a bank was even planned for the site. Today, a myriad of retail exists along with the church, including a large grocery store named Ultra Foods which has set up shop inside the former Courtesy Home anchor. The transformation of this property, from Naval weapons facility to retail mall back to tax-exempt status as a church is quite the wild ride, and we’re glad to be able to properly document the journey. The pictures featured here were taken in June 2000, and a more recent set exists here. As always, feel free to leave some comments concerning the mall and its unique history. I had heard somewhere that it had been gutted and did not resemble a mall anymore. Looking at Bing maps, it looks like most of it has indeed been demalled. AJ Wright is now in the former TJ Maxx space, too. The church is actually at the back end of the mall, and there’s a supermarket in the former Courtesy Home Center. 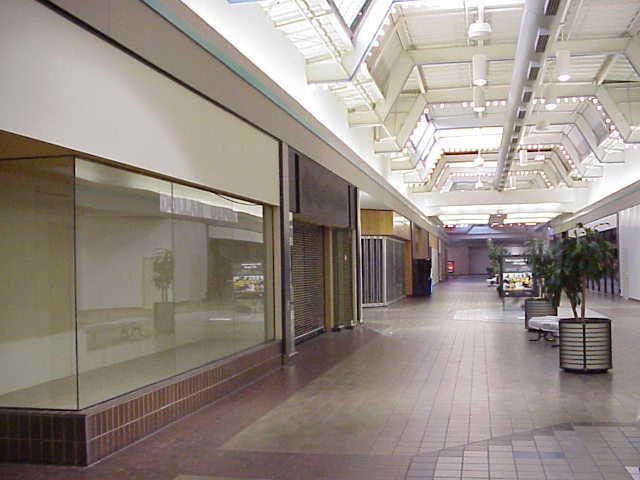 @Bobby, Yeah, I drove by somewhat recently and it looked like this, but apparently quite a bit of the mall part still exists too. See the flickr link at the bottom of the post, apparently that guy was in there recently. I thought it was totally de-malled too, but maybe not? I’ll have to investigate a bit more the next time I’m down there. Not sure I follow…but…is this still a retail establishment? Are there actual stores or is it predominantly a church now? @Oliver, the church bought the entire mall and uses most of the inside of the mall for church-related things, and they also lease space to interested retail outlets. So, it’s kind of both. Maybe I’m missing something, wasn’t there another mall on this site that also turned into a church of some sort? I think it was in Charlotte. 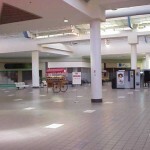 @SEAN, Freedom Mall in Charlotte, on this site, got turned into local government offices for the most part. You’re probably thinking of the one in Shreveport. 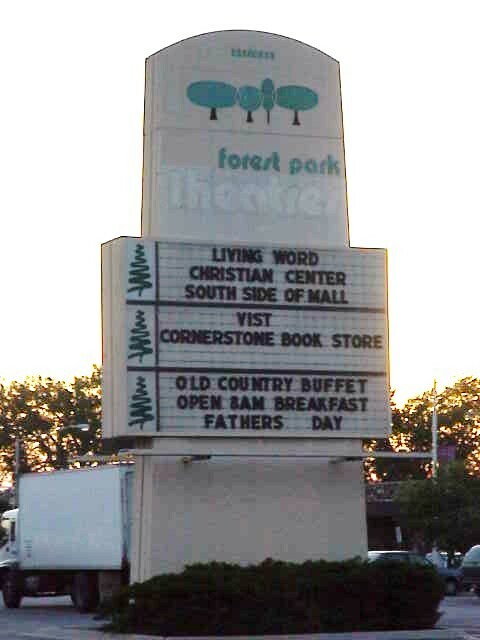 That one was a much larger, super-regional mall that is still intact and got ‘churched’. @Prange Way, Thanks for clearing that up. Another one is the Owensboro (KY) Christian Church, which replaced a Woolco store in Lincoln Mall mini-mall; along with the rest of the mall. Deadmalls has a blurb on it. Found this interesting website a few weeks ago. 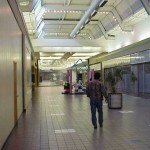 I’ve lived a few places in the Midwest- various towns and cities in Ohio & Illinois- and it is fun checking-out the status and comments regarding “the malls I have known” in the different places I have lived. 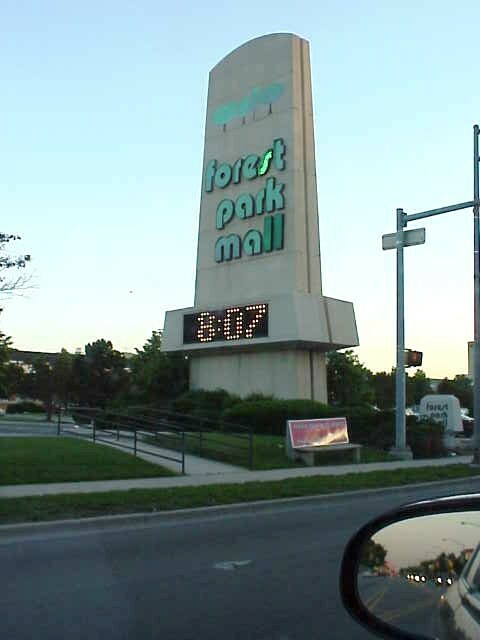 Currently living in the western burbs of Chicago and never knew Forest Park Mall in its prime- although, from the description, may be Forest Park Mall never had a “prime” time. A mega-church may in fact be the best use for the Forest Park space even if it does not generate any property tax revenue for the town. Let’s fact facts: The western burbs are over-malled and over-retailed, in general. For upscale retail, Oak Brook is only a few miles to the west. For the boutique stuff, Oak Park is very close by (and in fact most of the towns along the train lines have the boutique-type retail). Middle-of-the-road shoppers have the North Riverside Mall. And, at the lower end of retail, no shortage of big box stores along Cermak and Roosevelt Roads. No need for a Forest Park Mall. Amen! @James, I only went to Forest Park Mall maybe just once or twice in my life, and that was many years ago. Perhaps I should do a detour into this mall sometime, to see what’s left of this mall. The last time I went by this mall and saw it in the distance, I can definitely confirm there is a grocery store on the site(Ultra Foods), but can’t confirm if any interior parts of the mall have been demolished. Didn’t realize Old Country Buffet had closed, since I thought both OCB and K-Mart were the last stores left in FP Mall. Guess OCB has been gone for some period of time, and for whatever reason, I oddly remember going to the OCB in the mall years ago! Finally, I also completely forgot about the movie theater that was attached to this mall years ago. Does anyone remember if it was a Loews or Cineplex Odeon theater(I’m starting to recall it was a part of one of those 2 chains), and how many screens it had? The architecture of this mall is strange. Prangeway, correct the article plz. The former Courtesy is now a grocery store, not the church. The church is back behind Kmart. @Bobby, added a sentence about the grocery store. @Prange Way, You still left in a sentence about the church being in the former Courtesy. Might wanna fix that too so the article doesn’t contradict itself. @Bobby, actually I’m not sure this is wrong. It sounds like the church originally occupied the Courtesy space before ultimately taking over the entire mall. They may not be in the Courtesy space anymore (this is what I’m a bit confused about) since it appears a supermarket occupies at least part of that building but it sounds like that was their initial outpost here. That seems right. The Courtesy space apparently became the church before it became the supermarket. According to Bing maps, the church now occupies most of the mall. It’s sad to see the retail sector of our economy this destroyed. One thing of note is that the concept of a mall has changed, and it appears that this mall resembles an outdated concept. Today’s mall is more of a destination, not just an assemblage of retail stores. Just to clarify, Forest Park is not really a ‘post WW2’ suburb. Most of the housing there is from the early 1900’s, with quite a few 1920’s classic Chicago Bungalows. North Riverside, Hillside, and Westchester nearby were built up after WW2, but Forest Park is very similar to Oak Park/Berwyn/Cicero in the median age of the housing stock. 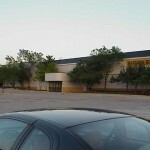 @Tomm, I think what basically occurred was that the big box stores likely popped up at the time FP Mall did. 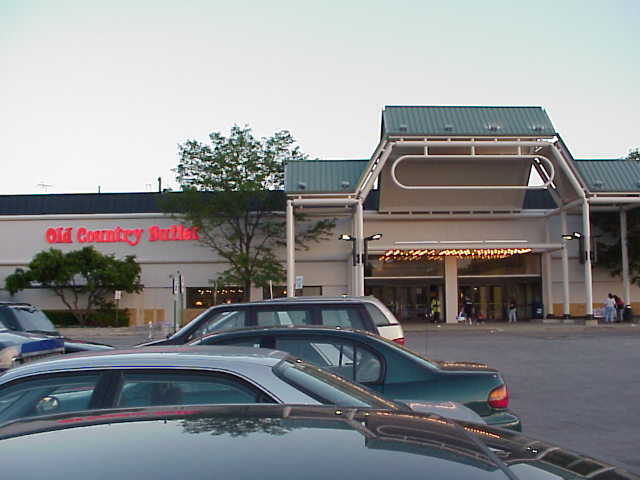 Over time, the North Riverside Mall became the dominant mall for the near west suburbs, due to both how much bigger it was, and the fact it had multiple big name anchors. And of course, the downtown Oak Park + River Forest retail area around Lake and Harlem probably absorbed some of the stores that used to be in FP Mall, such as Claire’s. 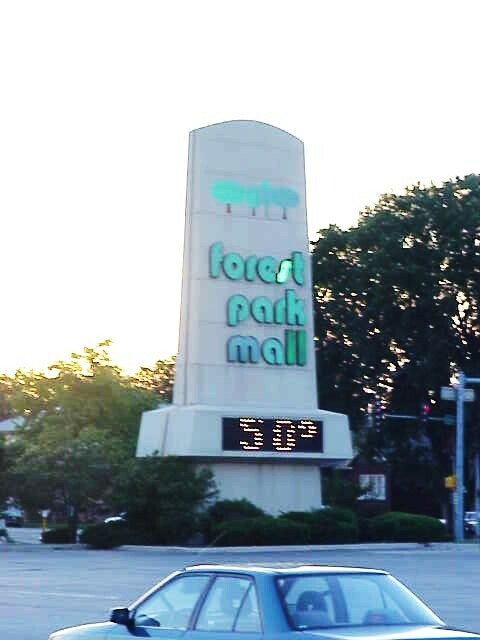 I’m only just remembering now that the FP Mall sign looks so darn similar to the sign for the Addison Mall shopping center on Addison Ave. inbetween California and Elston, that it isn’t funny! Switching topics a bit…all of the documentation on Labelscar about the decline of suburban malls- in both pre- and post- WWII suburbs- is interesting, but I believe the real news is the decline of the downtown malls. You know, those “vertical” malls built in one city after another in the 1990s, often with public subsidies, heralded as the sure-fire way to revive downtown retailing. In Cleveland, the Galleria opened with much fanfare in the late 1980s, thrived for a decade or so, and now is little more than a food court & shelter from the blustery winds at East 9th & Lakeside. Also in Cleveland, a few years after the Galleria opened, the massive 4-story Tower City mall was retrofitted into the bowels of Cleveland’s Terminal Tower. The opening of Tower City for a time seemed to promise an entirely new image for the unfairly slammed Clevelend- with a Barney’s New York, a Gucci, a Fiorucci, etc. With the early 90s recession, the loss of a department store anchor and other factors, the shine didn’t last long, and Tower City has devolved into a mall with a distinctlively “urban” vibe, multiple vacancies, wig shops and all. Not that there is anything wrong with that, but it is just not the retail star that it once promised to be. There are similar downtown mall stories in St. Louis and other cities. Closer to home, in Chicago, even that iconic retailing street, Michigan Avenue, is now dealing with the vertical mall blues. There are four vertical malls on Michigan. The newest, the one attached to Nordstroms, seems to be okay. The 8-story Chicago Place Mall is empty but for the street-front retailers. The owner of Water Tower Place is in bankruptcy. The most prestigious of the malls, 900 North Michigan, is dealing with multiple vacancies, particularly in the upper floors. The “900” management even has an employee tasked with the job of decorating the vacant store fronts to make them look- well, not so vacant. Cook County’s confiscatory sales tax- 10.25%- which funds the Democratic Party’s patronage system in Chicago- no doubt has contributed to the decline. But, even with that tax, one cannot help but conclude that the mall shopping era, as we once knew it, is now dead. This whole thing started out as me wanting to reminisce about fpm and in searching for pics of the old toy store from the 80’s I used to go to as a child. Now I’m very saddened to find out how everything is gone. Deeply saddened by that and also the fact that the last commenter may actually be right about the mall era being dead/passed its prime:-( something about going back to this place and transporting myself back in time makes me so happy feeling, now its no longer possible.